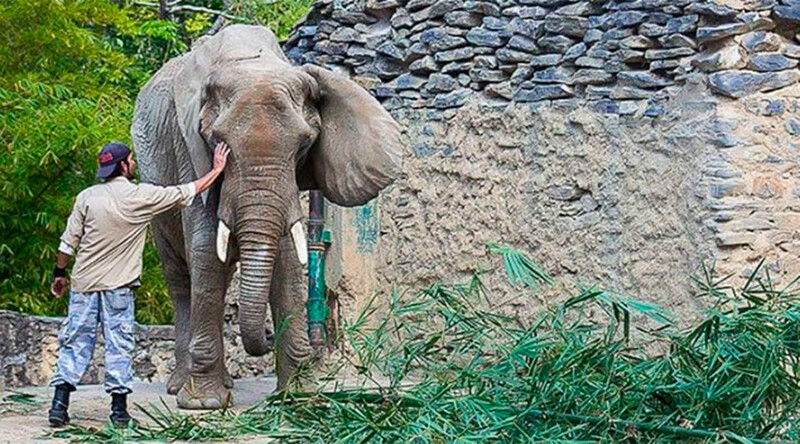 The last African elephant in Venezuela is at risk of dying of starvation, but authorities at the Caricuao Zoo have reportedly refused donations of food citing “security concerns,” enraging animal lovers both at home and abroad. “The zoo workers are not authorized to accept donations because there are people with good intentions, but others with different intentions,” Marlene Sifontes, leader of the National Parks Institute (INPARQUES), reports El Colombiano, citing the AFP. The zoo claims that photos of the emaciated elephant that have been published online were photoshopped. However, video footage of the gaunt pachyderm has also been shared online which shows Ruperta to be equally skeletal and malnourished. Ruperta’s situation has drawn criticism online, with #SOSRuperta trending in the past week. An online petition calling for Ruperta to be relocated has also been launched, with the goal of 100,000 signatures. Earlier this week, Paris-Michael Jackson, daughter of the late King of pop Michael Jackson, took to Twitter to decry the situation as “inhumane” and pleaded on behalf of Ruperta and all of the other animals suffering similar fates throughout Venezuela. Ruperta arrived at the zoo at six years of age but now, forty years later, she looks severely underweight given that the average weight for a mature adult female African elephant is between 6,350kg and 7,000kg. “There is food but not enough variety. They were only giving her auyama (a type of pumpkin) and papaya, which does not cover her needs,” Sifontes added. Elephants in the wild can live up to 60 years of age, but those in captivity can reach the age of 65 or 70. “Even though the government is unwilling to accept it, Ruperta is not the only animal in Caricuao zoo that is suffering like this, and Caricuao isn’t the only zoo where this is happening,” Sifontes added. The extreme scarcity of food in Venezuela is so dramatic that a horse at the Caricuao zoo in Caracas, where Ruperta resides, was dismembered last July by unknown assailants who entered its corral and stripped it of its meat, reports El Colombiano, citing the Public Prosecutor’s office. Venezuela has been wracked by economic turmoil in light of the oil price plunge which began in 2014, as oil exports account for 90 percent of Venezuela’s overall exports.